When we walked down to the beach Thursday, we found this sea lion at the base of the stairs. I called the local Marine Mammal Center to report this stranded animal, but a very sympathetic volunteer told me they were short-staffed (they are almost entirely volunteer supported) and that if the sea lion was not injured it could take 24 hours for a crew to respond. They are simply being overwhelmed this year with rescues. I told them I would check back on the animal in the morning to report to them if he was still alive. That's how I left it. On Friday morning, with trepidation and heavy hearts, we walked down to the beach to see if our sea lion was still there. Why yes, yes he was; and he was still alive! But now there were two more stranded, as well. Fortunately, there were also two rescue volunteers already onsite, assessing the situation. Roger and I talked with them for a while; they were calling for two trucks to handle this rescue. One of the younger animals was definitely injured and would need to be taken in. The one we had seen the day before was still hanging in there, but was obviously in distress. The third one didn't look too bad and so probably wouldn't need rescuing. We felt very confident that things would be okay, and so left to come back home. The older male that we had seen the day before was still there. He was lethargic, but still alert. We waited for the rescue truck to arrive. While we waited the sea lion changed positions several times. I can't tell you what a relief it was to see this animal move. Every movement was a confirmation that its heart was still beating. Each slow rise of its chest meant life. That he had survived this long was already a surprise, so now we were focused on getting it some much-needed help. Help arrived, and the rescue was absolutely flawless. One of the volunteers took a very large net on a very long handle, and threw it over the sea lion's head. Then, the six other volunteers that had arrived surrounded it with wooden boards, which encouraged it to move forward into the net. The net is then turned so that the opening faces the carrier. Voila! The sea lion is taken away. The number of sea lions needing rescue this year has just surpassed the all-time high of 1129 in the 1989 El Nino year. Thursday came in it at 1130, and still counting. This one might be 1131, I have no way of knowing. But the rescuers told us that we could follow its progress on their website. They were going to call him RoRo, for Roger and Robin. We were deeply honored by their suggestion. They came from the city, they came from the country, they drove hundreds of miles and hitch-hiked across the state to be there for day one of a three-day music festival built on a platform of peace. 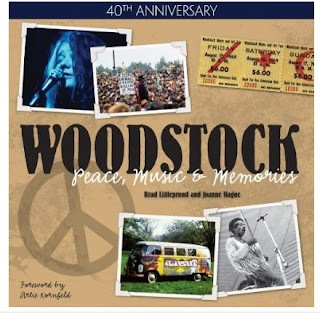 Learn about the experiences, the adventures and the lasting memories from the people who spent three days in a farm field, in the mud and rain and witnessed the transformation of three ordinary days into an extraordinary event known as Woodstock. "Everyone looked just like us," remembers Robin Chanin, then a 17-year-old from suburban New Jersey who was among the nearly 500,000 attendees. "It was a great equalizer. No one stood out. There was a moving river of blue jeans and flowing hair, lots of beads, embroidery and flowers. We parked our car in a field with others, and not knowing where to go, we joined the throng and the movement simply took us there." That's me they're quoting. I really am almost famous! But I have to admit I wondered if I should post this here after posting it two days ago on Facebook. I just don't know how to manage two online presences. It's weird, because I barely have enough of a persona to maintain one. And let's not even talk about Roger. He's obsessed with politics and finding us a place to live, and has to be cajoled into posting something here. I don't really like posting on the blog and then putting a link to it on Facebook. Readers have to decide whether to comment here? There? Both? Neither? The simple story is just that my siblings and I went to Woodstock 40 years ago. The anniversary fast approaches. The other day, after my mom saw the webpage advertising the book, I said, "Now aren't you glad you let us go?" Yes and no, robin, yes and no. The memorial service was incredibly touching. Ian's friends spoke of a young man full of integrity and honesty, of deep decency and political insight, and an ardent consumer of very good highs! He was a wild man DJ who was respected and dearly loved. What a good thing it was to hear such constancy of integrity in a young man's life. Ian's brother said how relieved he was to know that Ian had found his tribe. And yes, this tribe had gathered to say their farewells. On the way home I kept my eye out for the golden eagle we had seen on one of our earlier trips down to see Ian. I remembered the cow pasture and the far fencing where it had landed. Sure enough, that magnificent creature was there again perched on a fence post. Roger pulled over and stopped so we could take a better look. Oh it was far away, but that didn't stop me from trying. The cows were rather intrigued and kept their inquisitive eyes on us. Shortly before we drove off, they came down to the fence to see if maybe we might have something delicious for them. We had to apologize and move on. Such is life. looking down at the south fork of the yuba river from the old bridge on hiway 49. there are hundreds of deep spots like this along this stretch of the river. our trip to nevada county, in the foothills of the sierra nevada mountains east of sacramento, turned out well. we braved high temps (for us) and didn't wilt; at least not entirely. we liked the twin cities of grass valley and nevada city, 4 miles apart. both of those are at least a thousand feet higher in elevation than where we stayed with my sister in penn valley. the higher places are cooler, so that's where we are focussing our search for a home. our wonderful friend and agent here referred us to an agent up there who suits us fine. we will go again soon with arrangements to see several houses. if we find the right one we'll have to actually decide whether to live there. and then go through the real estate purchase maze. our agent, wonderfully complete in her flow of local info, told us that we should check out ozone air quality problems. she also directed us to the swimming area in the yuba river, pictured above. we found out that there are "spare the air days" in the area sometimes, due to ground level ozone, which is produced by the action of sunlight on the pollutants from vehicles and industry. hmmmmmm. a colorless and odorless gas, toxic to flora and fauna. hey! we're fauna! how toxic? the Sacramento Metropolitan Air Quality Management District website shows 5 levels of danger, progressing from good through moderate, unhealthy for sensitive groups, and unhealthy to very unhealthy. click on the map to get an animated map of the ozone contamination over time each day. "As ozone damages our delicate lung tissue, it inflames and constricts airways and upsets the fluid balance in our lungs. It can cause the muscles around the airways to tighten. The most common symptoms are a tight feeling in the chest, shortness of breath, and a decreased performance level in athletes. Studies are being conducted to evaluate the role of ozone exposure to the onset of asthma. Other studies indicate an increase of emergency hospital admissions from respiratory distress during periods of elevated ozone concentrations." the high ozone levels are caused by both local traffic and ozone produced 50 miles away down in the sacramento valley, that drifts upward and eastward and bumps up against the sierra nevada mountains and a temperature inversion. it does, apparently, over time dissipate or drift upward, hopefully to join the tattered ozone layer up high, which we humans have damaged. when the ground ozone level goes up we are encouraged to drive less and perhaps even stay inside. at least to lighten up physically. children are affected more than adults, as are people with respiratory problems and older people. we don't have breathing problems, we are moderately old. this isn't a proverbial deal-breaker. we have to live somewhere. how's the air where you live? We've been away from the coast since Monday. We headed inland to the hot interior of the state to look at houses and land. But for me, I always just get sidetracked by the critters that cross our path. Houses are so blah blah blah. Dragonflies, turkeys, and various beautiful unknowns are what catch my attention. So here are a few the important things we've been seeing in the neighborhood. 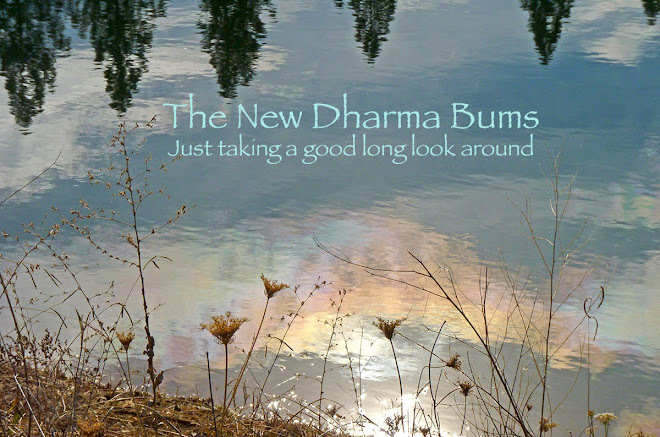 We spent Wednesday playing and skinny dipping in the Yuba River. Here's Roger cooling off in the 100+ temps. It's the pretty things that always catch my eye. The local news has been full of stories about our California sea lions. They're hungry and dying on our shores. We hear them at night barking and barking. It's never quite been like this. The other day I noticed one climb up on to a dinghy tied to an anchored sailboat. I grabbed the binoculars and watch a few more hop on board. They stayed there for several days. I kept a watchful eye on them, knowing that sooner or later they would be ousted from their resting spot. On Sunday, while I was busy doing household chores, the sailboat owners came and displaced those forlorn beasts. I didn't get to see how they were compelled to leave. The dinghy was empty while a crew of four spent the afternoon in the sailboat basking in the California sea and sun. I had hoped once they left, the sea lions would return and rest easy in their safe place, but by Sunday evening the dinghy was still empty. We are living in a tourist town at the moment and it has pretty much driven us insane. Well, it's not that we weren't insane before, it's just that it was at a comfortable and manageable level. Now our abhorrence of crowds and noise has driven us indoors on even sunny days. While it may be true that what happens in Las Vegas stays in Las Vegas, what happens in our little tourist town filters up from the streets into our open windows. We hear a cacophony of car radios, conversations, sirens, dogs barking, coast guard helicopters, slurred foul shouts from the throats of ignorant drunks. There is an omnipresence of noise matched only by the endless light that casts its eerie glow rippling out and further out on to the night sea. It never freakin' ends. If you were to look out the window at the expanse of Monterey Bay that spreads before our eyes everyday, you'd swear we were in the most heavenly spot on earth. But here's what living here the past nine months has revealed to us: The ocean cannot defend itself from our every insult. What appears pristine is a body of water that no longer can adequately feed the marine life that must find food here here. The sea otter, which once made a comeback from being mercilessly hunted for its fur, is in decline for the first time in a decade. Sea lions are dying in droves. Yearlings are washing up on our local beaches. We spared you a photograph of one that we spotted just below these achingly beautiful cliffs. Both the pelicans and cormorants have been starving this year. We watch them flying back and forth, back and forth searching for what we have already taken by the net-fulls from the sea. There is something so incredibly pacifying about staring out at an endless horizon along an expanse of blue blue waters. So many come here to appreciate this beauty, but many come to treat the earth with a heartless disdain. Their fishing lines snag and snarl whatever innocent happens along; their propellers rip the flesh of unseen mammals; their oil and gas leave paisley slicks on the surface; their effluence goes straight to the heart of the matter. People often ask us why we would ever want to leave here. There is only one real answer: Staying means staring into the most beautiful of illusions everyday. Thank you all for your support and kind words. June was a very rough month, but now July is coming at us full on. We're glad. So, good-bye, June, and good riddance.